The piece is by Darlene Pekul and appeared in the May 1980 issue. 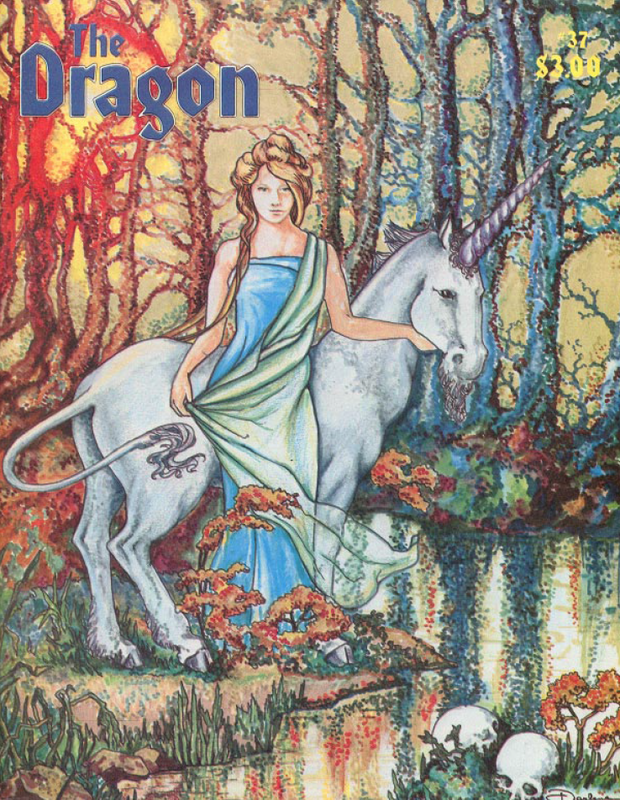 I am fond of it partly because it graced the cover of one of the first issues of The Dragon that I purchased, and thus it helped to define the look of the game for me. Its pastel colors and serenity provided a neat contrast with the usual fare. Oddly, I never noticed the skulls until now. Pekul (who legally changed her name to the one-word and capitalized 'DARLENE' in 1984) was one of the most prolific of the early TSR artists. 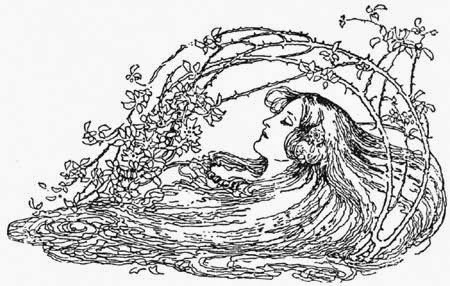 Indeed, that same issue of The Dragon seemed to feature her work on almost every page, from city and wilderness illustrations—'From the City of Brass to Dead Orc Pass'—to calligraphy and background design—Out on a Limb, Leomund's Tiny Hut—to the comic strip, Jasmine, which would run for twelve issues. She also was responsible for the 'fat unicorn' on the title page of the Dungeon Master's Guide, the cover and interior art for a number of TSR adventure modules and perhaps most famously, the full-color map of the Flanaess for the 1980 World of Greyhawk release. Curiously, Image Googling 'Darlene Pekul' or even 'Darlene Pekul The Dragon' or 'Darlene Pekul Dragon Magazine' does not yield this OSR Art Friday's featured piece. Doing a reverse search seems to imply that it has rarely, if ever, been previously discussed or featured. I hope this post, in its small way, helps to redress that. Embrace the Random: I propose that creating a dungeon is a bit like writing a novel. For many people, starting one is intimidating because they assume that you have to have all of this stuff in your head beforehand. Most people are incapable of having all of that stuff in their head beforehand, so they get scared off. What they don’t understand is that much of the ‘stuff’ will emerge organically—later. You don’t create by setting down what you’re already thinking, but to discover what’s, so to speak, already there. Random generation is the engine that allows you to discover things. In Vol. 4: The Campaign, I cite the comments of C.S. Lewis on this. The other stumbling block is feeling responsible for every decision. Should I put this monster or that monster in that particular room? What is the right thing? What if I do the wrong thing? That feeling of responsibility can be daunting. But random generation takes it off of your shoulders. Or so it seems. It’s all sort of irrational. But it’s how many of us think. Or at least it’s how I think. 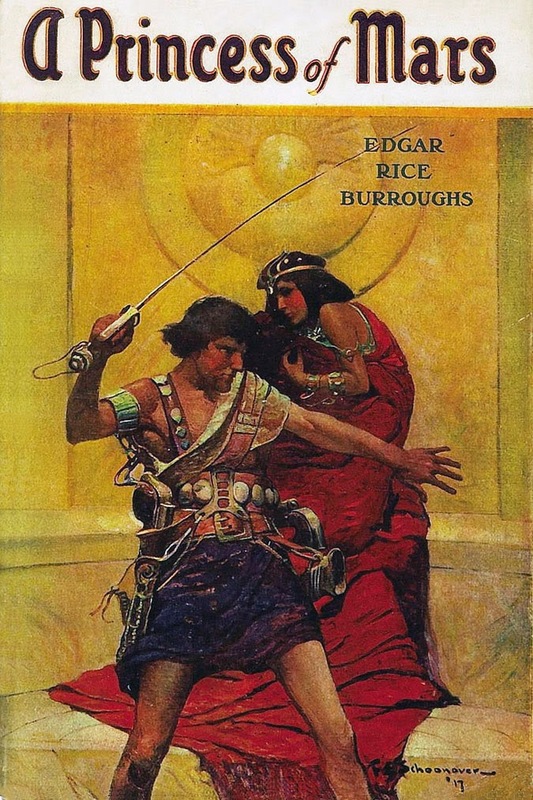 What Initially Reminded me to Embrace the Random: In his introduction to the seminal contemporary megadungeon Barrowmaze, the author, Greg Gillespie claimed that much of the dungeon was generated randomly. I thought, wait, that’s legal? You can create a dungeon randomly and then sell it for money? Count me in, man! Level Variance: On P. 9 of Vol. 4 I laid out tables of monsters for each dungeon level. Each table spanned six or more monster levels, such that you could, say, get 4-24 of the weakest vs. 1 of the most powerful. I then wrote: ‘For greater variation, consider a wider possible spread of monster levels: die 1 = one (table) level lower, die 2-5 = specified (table) level, die 6 = one (table) level higher.' For this dungeon I increased the extremes such that die 1 = two levels lower, die 2 = one level lower, die 3-4 = the same, die 5 = one table level higher, die 6 = two table levels higher. Thus, on say the 3rd level one might encounter anything from 3 Giant Rats (at the absolute lowest possible end) to 1 Basilisk (at the absolute highest end). Is this variation good or bad? I have no idea. Keep in mind, though that ideally the players will often not be able (at least at first) to easily identify the level of difficulty of the monsters. How powerful are those frothing mammals swimming through the water at us? Who knows? Non-Random Patterns: For new monsters, I decided that there would be a 1 in 3 chance that they would be the same as previously encountered ones. Die 1-2 = a random roll of all monsters previously encountered in the entire dungeon in numbers appropriate to the level, die 3-4 = a random determination of previously encountered monsters on that level, die 5-6 = a random determination of previously encountered monsters in that section. This creates meaningful patterns that make sense. Hopefully the repeating ones will be interesting and not boring. If they seem boring, perhaps there’s a way of making them more interesting. A Mistake: I screwed up slightly on the algorithm for treasure not guarded by monsters. It’s supposed to be 1 in 6 of all unoccupied rooms. But my Excel randomizer algorithm only did 1 in 8. I will reroll unguarded treasure for the first two levels. Just So You Know: That said, obviously much of the flavor, tone and mechanical interest will come from traps and features added later. But the monster distribution helps to trigger ideas for this. Why are there so many Martians? Is this a good thing? Out of the 99 monster assignments in the first two levels, 6 are Martians. This is very close to precisely what the tables would predict, as Martians make up 1/18th or 1/19th of each table. The Zylarthen dungeon monster encounter tables are not naturalistic. That is, I didn’t set out to have them track some previously decided scheme of proportions. Rather (with only a few exceptions—dragons, most obviously) each monster is represented precisely once in the tables (and I decided that the different ‘colors’ of Martians would each be a separate monster). Each table for each level generally includes one monster from each of 15 or so categories—getting 'weirder' the higher the die roll. Thus, there is generally 1 mundane mammal, 1 giant insect, 1 prehistoric, 1 undead, 1 Martian and so on in each table. Since the humanoid Martian species are clustered in the lower tables (as opposed to the Orluks, White Apes and so forth in the higher ones), there’s roughly a 1 in 20 chance on these tables that a new monster will be a Martian. I guess I think this is fun. But other dungeon creators are of course free to reroll if they find this bothersome. It's called Sleeping Beauty's Dungeon. No, it's not another Ann Rice Novel. I thought I would create part of it in the open, so to speak, using the dungeon creation rules from Vol. 4, The Campaign, which in turn are of course quite similar to the suggestions put forth in The Underworld & Wilderness Adventures. Step 1 is to generate the rough structure of levels and sections. Each level has from 1-6 sections, containing 1-40 rooms apiece. This may sound like a lot of rooms, but it actually works out to be only about half the size per level of, say Stonehell Dungeon. Much of the narrative and tone will be determined by the (randomly generated) monsters. But obviously, as things proceed I reserve the right to tweak, edit, change, delete and make stuff up according to whim. One tweak I've made to monster stocking is that for any monster lair, on a roll of 1 or 2 out of 6, the type of monster will be one of those that has already appeared--in the current section, level or even from a nearby level. So much for the preliminaries, let's jump in. For no particular reasons other than for the fun of it and to get people's attention, I put another neat Pete Mullen painting at the top of this post. This one is from the original Dungeon Crawl Classics RPG book. Pete Mullen kindly sent me a high-resolution version of his commissioned piece for The Fane of Poisoned Prophecies. The recent OSR Art Friday post here has been updated with the better quality scan. 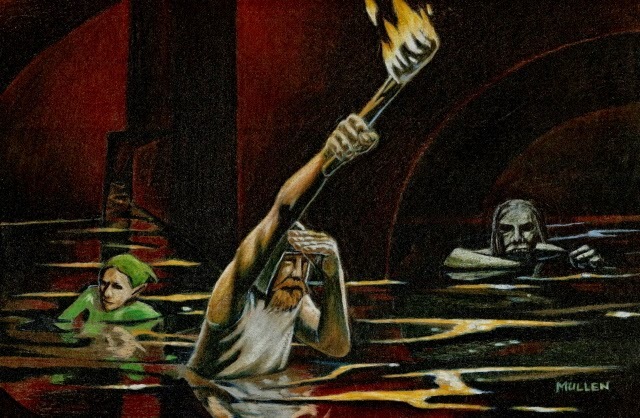 For those wondering about that painting of the adventurers wading through water (featured in the same post), the artist reminded me that it was from the adventure module White Dragon Run by James Boney. 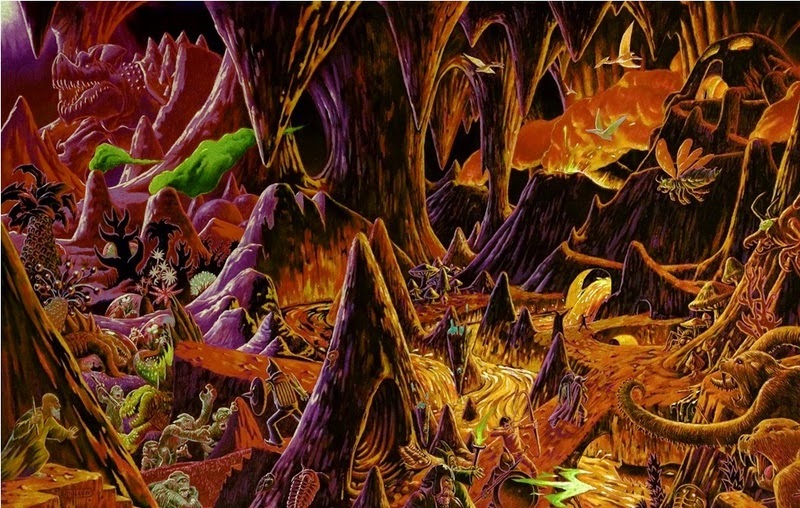 The above piece was created by Pete Mullen for the Chaotic Henchmen Productions module The Fane of Poisoned Prophecies, authored in 2009 by Guy Fullerton. This blog post is about the work of Pete Mullen. There are many talented artists associated with the current OSR movement. But Mullen is at the head of the pack. 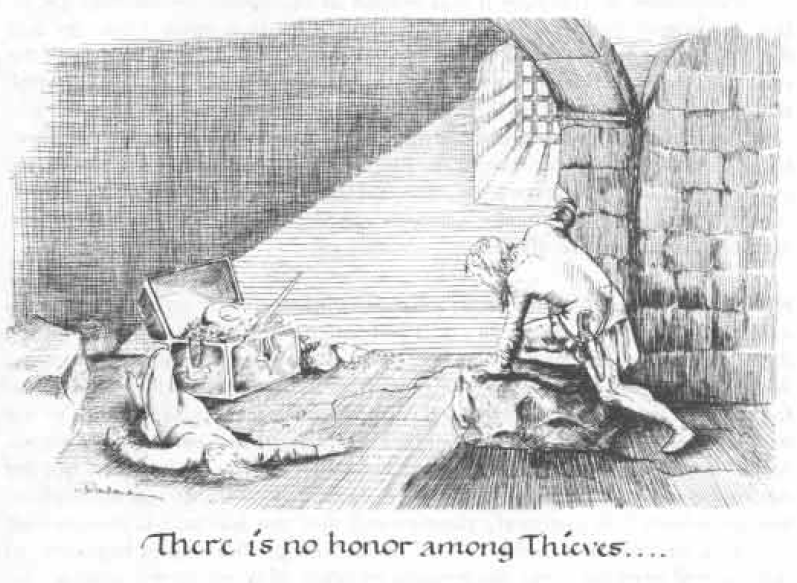 If anyone deserves the title of The OSR artist, he does. Part of this is due to the variety and diversity of products he has done illustrations for. A partial list would include Lamentations of the Flame Princess, Swords & Wizardry (he provided the cover illustrations for both the WhiteBox and Core editions) and Dungeon Crawl Classics as well as various smaller games and companies such as Ruins & Ronin and of course Chaotic Henchmen. But more importantly the tone and quality of his work practically screams OD&D*. Many of his illustrations center around an adventuring party doing what adventuring parties do--fighting of course, as in the above—but just as interestingly and evocatively, exploring, pausing, thinking (which way to go now? ), plundering (after a battle) and so on. The text below will be interspersed with a few other works out of a great many that I could just as easily have featured tonight. My only bias in choosing them is that I tried to pick pieces that were perhaps not quite as well-known as his more famous covers. I think there are several key differences between these two generations of fantasy art (Old School versus standard contemporary]. In terms of subject matter, the fantasy art in the seventies and eighties had their fair share of super heroes and strange monsters but their work encouraged the viewer to use their imagination and ask the question of "What the heck is going on here?" To me, the fantasy art in this day's market has more of an instant gratification element to it. When I look at it, I say, "Cool!" But then I'm left with, "Now what?" I find that I don't pursue the, "What the heck is going on here?" questions beyond that initial "Cool!" When producing my art work, I try to get the viewer to ask the "What the heck is going on here?" questions. The piece I featured above would seem to almost buck this. We know what's going on, don't we? The party is fighting a group of Giant Scorpions. Three party members are engaged in melee while the fourth—pretty clearly the Magic-User—is casting some sort of probably offensive spell. But even here in this more 'obvious' scene, the viewer finds himself asking questions which serve to more thoroughly engage him in the painting: What is the spell? It appears to involve some sort of bright globe. Is it a Light spell? Why would the Magic-User want to cast that? And the way those columns are spaced and drawn is sort of...stressful. Are there other Scorpions about to scuttle around from behind? Did the party attack them in their lair or are they being set upon by surprise? The piece is exciting not because everyone is flying through the air like Chinese martial-artists (as in a typical 4e illustration) but because we really don't know what's going to happen next. And I think the center of it is the Magic-User's raised arms. 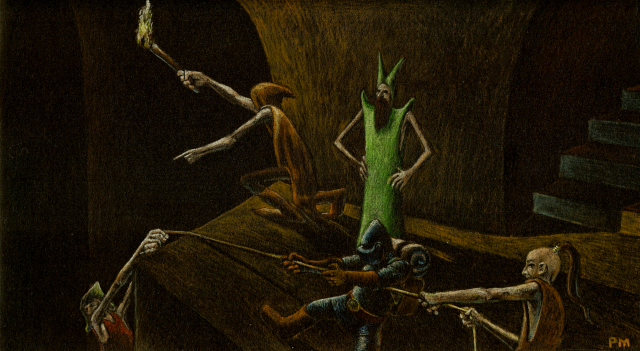 I chose this illustration partly because out of all the Old School or OSR works that I have seen (a lot) this is the most evocative rendering of a spell cast in melee that I have ever come across. Now, in previous posts I have disparaged the 'cartoony' aspect of contemporary 'New School' art. But it's clear that Mullen's work is cartoony in its way. We know that people or dungeon adventurers don't actually look like this. The representations are abstract or exaggerated in a certain sense. So what gives? I'm not an experienced or schooled art critic (obviously) so call me out if I make some howlers here. But to me the difference is that, say, 4e art looks video-gamey because it's almost saying, this is what your fantasy world looks like. Since (by assumption) you think video games are cool, we're going along with that by portraying your fantasy world as a video game. Isn't that cool? Or, see, we're cool too, or whatever. But Mullen is not treating us like we are babies or passive consumers. The shoulders on his Magic-Users are not pointy or angular because we think that's how they actually are, but to stress the point that they're thoughtful, logical Magic-Users. That's what grown-up art—art made for grown ups—does (or at least often does). Mullen has sometimes been portrayed as a sort of Erol Otus wannabe. This is a slur. Not because there's anything wrong with Otis. He's also brilliant, of course. But I think Mullen is up to something a bit different...and unique. I don't know what he is doing now. I assume he is still available to provide illustrations for OSR games and modules. I certainly hope he is. His site—containing the above and many other neat illustrations—is here. * I owe the precisely appropriate 'screams' designation to a Google+ comment by Theodore Kabisios, referring to last Friday's OSR Art offering. Those of you that who haven't voted on the Zylarthen name shortening thing (wait, I just prejudiced the vote there) have until 11:37 PM Pacific Standard time to get your vote in on the comments section of this post. Again, you might win hardcopies of Seven Voyages of Zylarthen, Swords & Wizardry WhiteBox, Stonehell Dungeon or Anomalous Subsurface Enviroment—all pinnacles of OSR genius and creativity (well, three out of four them, at least). By the way, there's a rumor going around (started by my own ambiguous wording more than anything else) that I want to rename my game. But it's only a question of finding an appropriate shortening of it. You guys know that right? Author's Note: this is the long overdue third part of a series that I began over eight months ago (Part II was on 17 February). Those interested in the topic are directed to the first two installments here and here (don't worry, these posts are not long by this blogger's current standards). Realism. You want to realistically simulate how actual historical weapons performed against actual historical armor. Playability. You don't want the system to be too complicated or fussy. Enhancing (or at least not impeding) weapon diversity. You want the system to give players more meaningful choices in weapon selection, or at least that the range of choices should not be narrowed any further. So, for example, if in the basic combat mechanic a sword is almost always better then a mace, then ideally the additional weapons vs. armor type mechanic would give players more of a reason to (sometimes) fight with a mace—perhaps blunt weapons are better than bladed weapons against really tough armor, or whatever. Enhancing weapon diversity is almost by definition more 'realistic' in that we know that historical medieval and renaissance fighters used a variety of different weapons. The criterion is also almost self-evidently true in that if all the new system does is to mimic or amlify trends present in the initial mechanic, it isn't clear that there is any need for the new system. For example, if in the original system a two-handed sword does 1-10 points of damage and a dagger does 1-4 points of damage (translating into the sword being more than twice as effective as a dagger), one might wonder whether there is really any point in imposing an additional mechanic stating that, say, against most types of armor a two-handed sword gets an average +x bonus to hit, whereas a dagger gets an average -x penalty to hit, etc. One could have just as easily have simply increased the basic damage of a sword and/or decreased the basic damage of a dagger. But from the point of view of historical realism there is much that is odd. For example, why are maces so ineffective? Knights and other accomplished soldiers often went into battle wielding maces (and almost never large two-handed swords—unless they were Scottish). This is presumably because they thought maces were effective in combat, not because they were prohibited from shedding blood, or whatever. So why are they presented as so ineffective here? Of course, paying attention to the space requirements does modify the above assessment a bit. For example, maybe you can't use that two-hander in many dungeon situations. I think it's fair to say that most referees didn’t and don’t often take this into account. Perhaps they should. But I think it's also fair to fault the authors for providing no further guidance on this in an otherwise fairly detailed treatment of other combat matters. However, the space requirements don't remove all of the oddities. For example, it's still always better to have a sword instead of a mace or a two-handed sword instead of a halberd or flail. Also, the 'space required' caveat doesn't help with the knight counter-example (they usually went into battle in open fields). 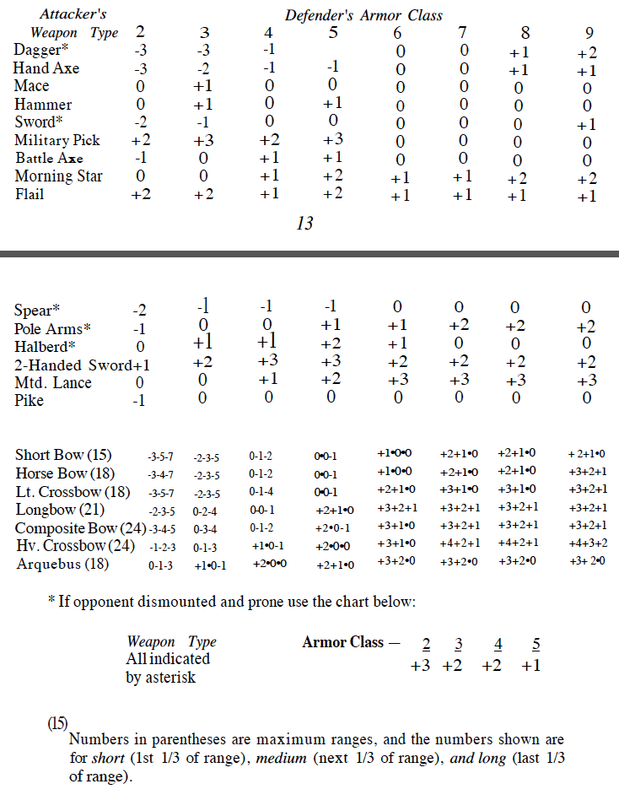 If one compares the Greyhawk table with the Chainmail table, one can see that the bonuses and penalties of Greyhawk were read off of the earlier chart almost verbatim, with slight modifications in only a few cases. So, for example, assuming a 'normal' Chainmail kill chance of 8 or more on two dice, a 7 translated into a +1 bonus, a 6 translated into a +2 bonus, a 9 translated into a -1 penalty, and so on. Now, of course, in Chainmail there was no extra downward slant in the table—a lack that no doubt looked odd to some. Thus, for many weapons in Chainmail you had about the same chance of hitting (and thus killing) an armored man as an unarmored one (indeed you had a slightly better chance in a few cases). But this sort of 'flat' progression in Chainmail translated into imposing the same bonus or penalty on an already downward sloping set of chances in Greyhawk, yielding results that seemed more realistic. Thus, armor now usually helps whatever weapon you are confronting, with different weapons merely having a different rate of change against certain types of armor. On its face, this is of course an improvement on the Chainmail system, while also preserving many of its virtues. For example, the new system highlights how ineffective most missile weapons are against heavy armor, especially when fired at medium or long range. 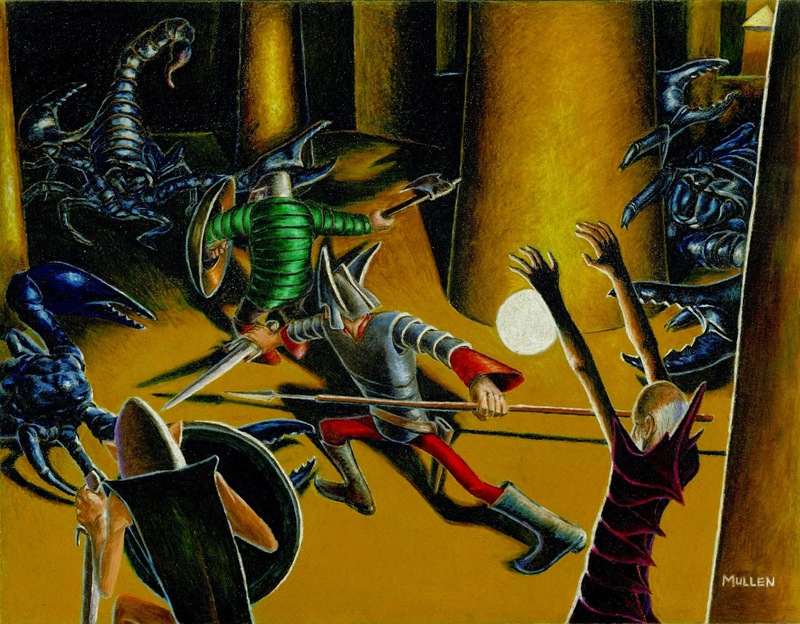 The option of effectively using a dagger or sword against a 'prone' target remains, although no rules are given for how to get an opponent into that position. However, the same historical oddities and (in my view) mistakes remain. Two-handed swords and flails are still weirdly misdescribed and are too powerful. But in my view Greyhawk’s effort was a failure for many reasons, and the evidence suggests that its system for variable weapon effectiveness against armor was rarely used in actual play (early players could help me out by confirming or disconfirming this). Secondly, the Greyhawk scheme is too complicated and fussy. You start out by comparing your class and level with your opponent's armor class (the basic OD&D combat mechanic), but then you have to look at the new chart to see if you get an extra bonus or penalty (on top of any other bonus or penalty due to magic, tactical position, etc.). But you only get this bonus or penalty if the referee judges that the armor class of your opponent is sufficiently 'armor based' to warrant it. (Even at this early date, the idea of 'armor class' had diverged from being an actual class or type of armor—as it was in Chainmail—to often being at least partly based on other 'defensive' characteristics of the target—its parrying ability, speed, size or even just innate power or ability to soak up damage.) For the majority of melee weapons and armor types the bonus or penalty changes things by no more than 1 point anyway, so one might forgive the referee and players if they ask why the extra work is really necessary. Thirdly and perhaps most importantly, the mechanic doesn't increase weapon diversity or player choice. Now, I admit that it might initially look like it does. So for example, it might be argued that with the new mechanic we can see a reason why a mace might sometimes be preferable to a sword—it's more effective against plate armor—or why a flail might sometimes be preferable to a halberd—it can reach around shields and penetrate armor better than a halberd can. But I submit that it suppresses weapon diversity, often in odd ways, if considered in total. For example, there is now even less reason for a Fighting-Man to even consider using anything but a two-handed sword. The mace might seem to beat out the sword against plate armor (though it isn't clear that this would make up for the sword's higher damage roll) but if one looks more closely, the new bonuses and penalties create new and worse problems. Why ever choose a mace when you could instead choose a hammer (which gets that extra unexplained +1 against AC 5)? Or for that matter, why ever choose a hammer when you could choose a military pick, which is much better against tough armor while inflicting the same damage as a mace or hammer? 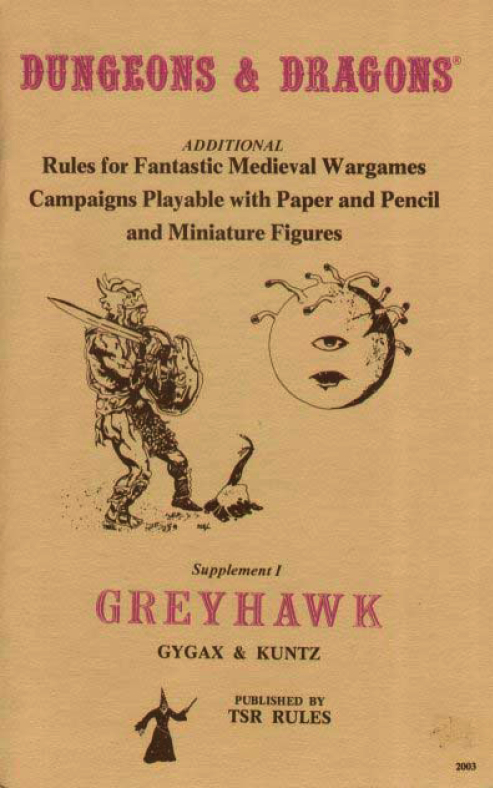 Without sounding too critical, I honestly doubt that the authors of Greyhawk--Gary Gygax and Rob Kuntz--thought very hard about these issues or problems. After all, the to hit bonuses and penalties were so clearly taken from Chainmail, without really modifying them in the slightest, even though the underlying combat mechanics of Chainmail and OD&D were very different—a 2d6 curve is differently shaped than a 1d20 curve, to give one obvious example. 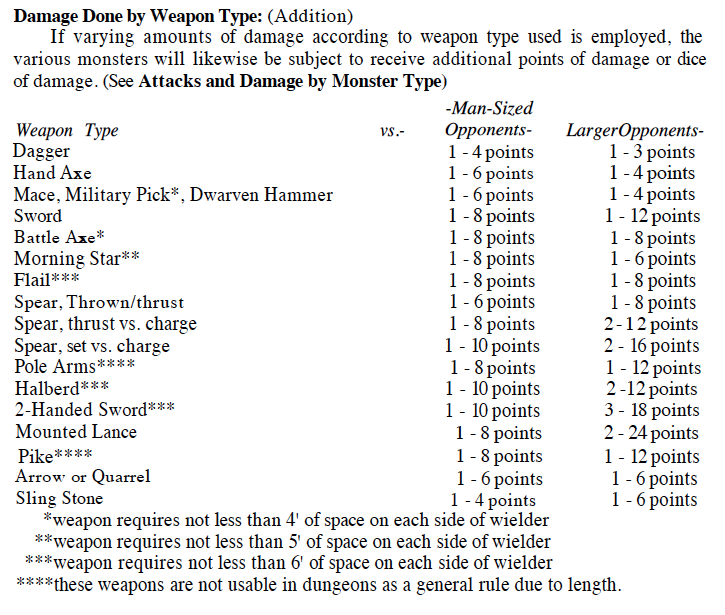 Perhaps Jon Peterson or one of the players from those early days can tell us whether the Greyhawk weapons vs. armor option was ever really used for OD&D by the authors or any of their early players. The effort looks to me like it was merely another combat option offered to sort of fill things out in the apparent interest of enhancing 'realism', but composed quickly and without any playtesting. I might be wrong. But if I'm wrong, it frankly makes the result difficult to justify or explain. So, I would have to say, unfortunately, that the variable weapons vs. armor mechanism proposed by Greyhawk was ultimately a failure.